For the GMV spotter, the easist way to identify a Special Edition model is by the decal below the fender script. Unfortunately, once a vehicle has been repainted, it is unlikely that this decal is replaced. According to "Ford of Canada - 100 Years Together" written by James C. Mays - Oakville, Ontario, Canada - August 2003, in April 1976, the Canada-only Special Edition Granada and Special Edition Monarch were introduced. These lessor-priced cars would boost sales significantly, pushing Ford's percentage of the compact market to 27.5% up from 26.7% in 1974. It is unknown if these models were carried to 1980. The Registy has documented Special Edition models up to and including 1979. 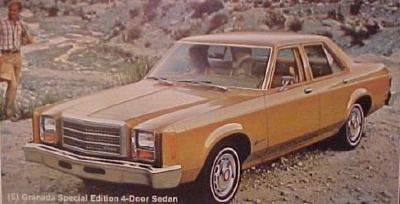 By the picture above, it would appear as though the vented front bumper which was discontinued in the 1977 model year for US models it may have continued on the Canadian Special Edition. In the photo album below are the 1976-79 Granadas and Monarchs which have been identified and registered. These Canada-only rarities also appear on the main Granada and Monarch pages.